believe that that actually happened). This week, we also celebrated the 88th birthday of John Glenn, the first American to orbit the Earth (some 7 years before Neil Armstrong blasted off). I had the honor of meeting Senator Glenn at the Smithsonian Air and Space Museum. He turned out to be one of the most gracious people I've ever met (and sharp as a tack, too). 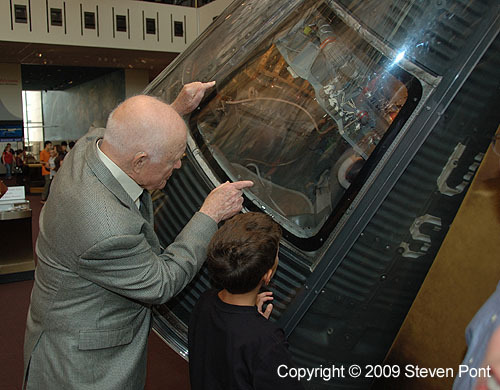 In this picture, he is pointing out a few interesting details of his Friendship 7 capsule to my 10-year-old son. This was an immensely cool situation that I hope my son can appreciate when he gets older.